Aarhus Airport (Tirstrup) is located 40 km north of Aarhus and offers international flight connections to e.g. Oslo, Stockholm, Gothenburg and London. Aarhus Airport also has flights to Copenhagen Airport with several daily departures. The flight from Copenhagen to Aarhus takes approx. 35 minutes. In connection with most flights, there is an airport bus service between Aarhus Airport and Aarhus city. Travelling time to Aarhus city centre is approx. 50 minutes. Tickets are sold on the bus at DKK 115 (one way) – credit cards, EUR, GBP, USD, NOK and SEK are also accepted. The final bus stop is at the train station in the centre of Aarhus close to the major hotels. There is a bus stop at main university campus. If you get off there, you can either walk (about 2 km) or shift to bus line 5A (direction: Tangkrogen). Get off at Viborgvej/Vestre Ringgade. The airport bus ticket is valid in bus line 5A if you connect right away. Copenhagen Airport (Kastrup) has daily flights to many destinations worldwide. Apart from the domestic flight connection to Aarhus Airport, there are direct hourly train services from Copenhagen Airport to Aarhus. The journey takes 3½ hours, and tickets are approx. DKK 418 (one way standard ticket). Billund Airport, located 100 km south of Aarhus, has direct international flight connections to several major European cities and a large number of other destinations worldwide. There is an airport bus service between Billund Airport and Aarhus. The journey takes approximately 1½ hours. Tickets are sold on the bus at DKK 160 (one way). Please note that the bus leaves the airport approx. 10-15 minutes after the plane has landed. The bus arrives at/departs from the main entrance of the SAS Radisson Hotel in Aarhus. From Copenhagen Airport there are hourly direct train connections to Aarhus. The travel time is about 3.5 hours. From Southern and Central Europe connections to Aarhus go via Hamburg/Flensburg. If you want to travel at night, it can be an advantage to go via Copenhagen. Travel time from Hamburg to Aarhus is about 5 hours. You may have to switch trains. From Eastern Europe and CIS countries train connections to Aarhus go via Poland and Copenhagen. From Scandinavian countries you can travel via Copenhagen or by ferry to Frederikshavn or Grenå, and from there by train or bus to Aarhus. Aarhus has direct connections to the great European network of motorways, making it easy to get to Aarhus from most European cities. From Hamburg Aarhus can be reached within roughly four hours. The address that you should type in your GPS is: Fuglesangs Allé 4, 8210 Aarhus V, Denmark. If you are traveling from other Scandinavian countries, there are ferries to Northern Jutland (Frederikshavn, Hirtshals and Grenå). Bus line 3A goes directly to the Department of Economics and Business Economics every 10 minutes from the city centre. Find the bus at Banegårdspladsen opposite the train station (direction "Tilst") and get off after approx. 10 minutes at the bus stop "Aarhus BSS" at intersection Viborgvej/Vestre Ringgade (second stop after The Old Town museum). Enter the yellow city busses through the rear or middle door and buy your ticket at the ticket machine. The price is DKK 20 (1-2 zones). Your must pay by cash. All taxis in Aarhus are metered and accept major credit cards. Tax and tips are included in the meter price. Taxis can be hired on the street or ordered by phone (no extra charge). You can also always find and hire a taxi at the Railway Station. The use of taxis should be confined to short trips in situations where it is not suitable to use public transportation, i.e. if you have problems getting to your point of destination on time. As a visitor at the Department you must fill in a reimbursement form to claim your travel expenses. Please note that reimbursement is only possible if an agreement has been made with the Department in advance. Copies of tickets etc. must be attached. 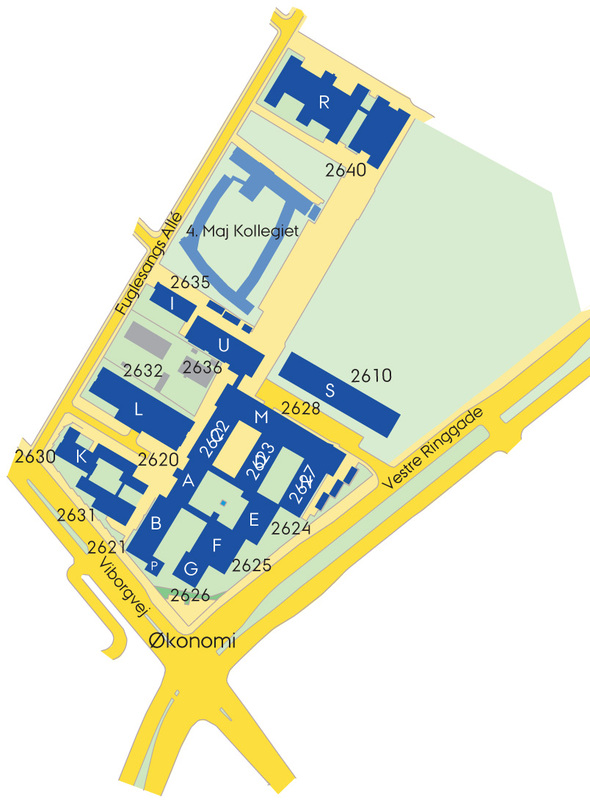 The Department's reception is located in Building 2620(A) - See map of the Department.